Welcome to the T-ist page. I know a few people who decided to join the false religion, and I decided to make a page for it. Basically, it’s a Mr. T repository. As far as I know, this was the first picture on Google image search with my URL on it. He is Mr. T, the man, you shall have no other T’s besides him. Thou shalt not speak Mr. T’s old name. Thou shalt cut the jibba jabba, fool. Thou shalt not covet Mr. T’s gold chains. Thou shalt grovel at the feet of Mr. T until pitied. Thou shalt not try to kill Mr. T. You know what happened to Saddam. Thou shalt not covet Mr. T’s other gold chains. Thou shalt not pity any fools. That’s Mr. T’s job. And here: We see the kind side of Mr. T. It’s a surprise that nobody was pitied. The site that first used this photo can be found by clicking on “The Show Must Go On” in my blogroll. Click here to continue to page 2-The Shrine! Oh man, this too cool. That’s what Mr. T is. 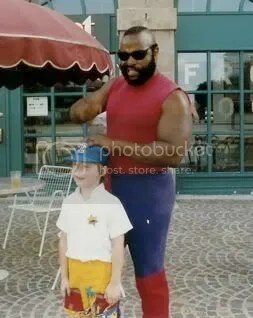 Well check this out, dude, one of my friends met Mr. T in the late 80s and her little boy took a pic with Mr. T.
The boy grew up, had the pic blown up to a poster and hung it in his dorm room at college. MR.T is amazing me and my friend Hugh think he is so cool. we even both bought MR.T hanheld soundboards! MR.T ROCKS!!!!!!!!!!!!!!! I’m glad to hear that. Keep on T-ing. *fervently worships Mr.T* this rocks!!!!! Yes. It does. Nice of you to notice. saaaaaaaay…ever wonder what Mr. T’s real name is? Mr. T is seriously Mr. T’s real name. He changed it from a name which I shall not utter. any idea i where i can find it so i can not utter it? Mr. T’s real name is Laurence Tureaud but do not utter it ever! It WAS his name. He legally changed it to “Mr. T.” So it shall stay. I know that’s you, dolphin. Hey Foooooool, Planet Ross just told me about your site ‘cos I’m a Mr T disciple. Thanks for increasing my love of Mr T and letting me worship in your chapel. I am your FOOL friend forever now. But I ain’t gettin’ on no stoopid blogs. Only COOL ones. Like yours. Now getchor hans off my man bling. Coolio. I’ll see you around. Drink yo milk an stay in schoo. 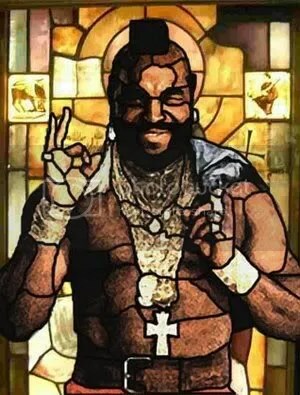 I’m glad you and so many others enjoy the Stained Glass Mr. T image. You likely won’t believe me, but I’m the originator of that particular image. I put it together in Photoshop originally for the Uncyclopedia, where it very quickly became popular, and eventually featured. Someone…pls post the image of the T-Shirt that says: “Stay in schoo, foo!” I cannot find it anywhere.